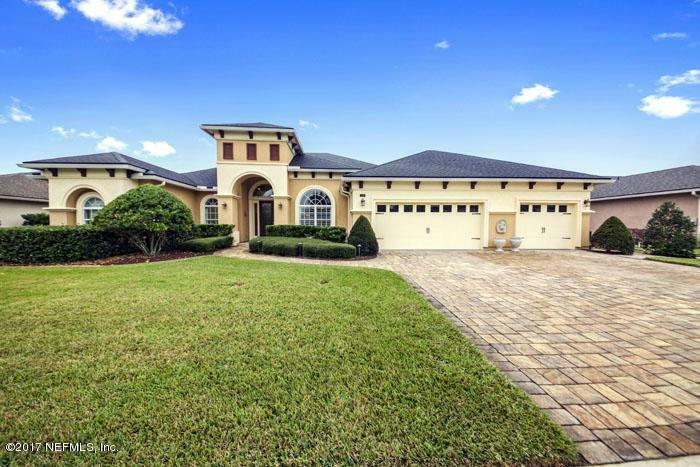 SAN SAVINO Have you ever envisioned your Dream Home with all the features that you would desire? This wonderful home will exceed all of your dreams. The owners bought the model with all of its many upgrades and then added more features that makes this a truly spectacular living space. Be prepared to ''catch your breath'' when you enter this 5 Bedroom, 4 Bath Home with 3-Car Garage and spacious Pool Area.This home has everything, including a Wine Cellar with its own temperature control system; a true Chefs Kitchen with 6-burner gas cooktop, 2 dishwashers, 2 refrigerators, convection microwave and convection oven and a warming drawer. There is a Butlers Pantry with wine cooler. The Gathering Room has a gas fireplace with stone mantle and built-in book case.The Study includes his & hers built-in cabinets and granite topped desk. The upstairs Guest Suite includes large bedroom, bath, breakfast bar, refrigerator and microwave. The Owners Suite has a spacious bedroom that opens onto the pool area, 2 large walk-in closets and a magnificent bath with spa tub. The Screened Pool Area is a spacious oasis of outdoor living with lots of covered area. The covered Grilling Porch has a gas fireplace, a Summer Kitchen with gas grill, refrigerator, 2-burner gas stovetop and access to the Pool Bath. There is also a spacious Covered Lanai for casual seating and conversation. All with pavers for that co0mplete Mediterranean feel. Everything is an upgrade and includes Plantation Shutters; Surround Sound; Security with Cameras; Hardwood and Carpet Flooring; Crown Molding; Fencing; Granite; Chandeliers, Solar for pool heating, hot water and for attic exhaust fan; two Gas Fireplaces; Pavers everywhere; and even a separate screened, paver area for children, pets, or specialty gardening. This spectacular living space requires a visit by you to appreciate how this home will fulfill your Dreams.